Julio Jost has been with Ponta dos Ganchos since 2013. He has worked in many diferent projects around Brazil as well as internationally. 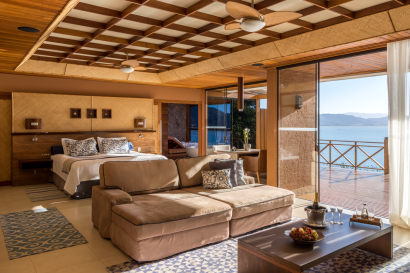 As a General Manager at Ponta dos Ganchos his key role is to ensure that the guest has an experience unique and memorable. Nowadays people have less and less free time, and more and more options to explore. That’s why it’s so important to make each experience unique and memorable. This is what we try to do with every single guest and as a reflect, our returning guest rates are well above the average for a resort like ours. 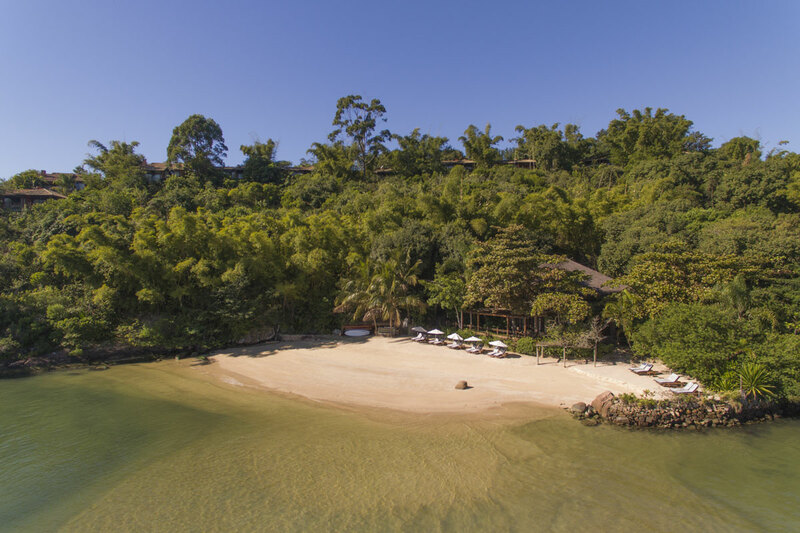 Ponta dos Ganchos Exclusive Resort was born from the dream of two friends who saw Brasil as a country destined for success and opportunities. Because they believed in these country they dreamed Ponta dos Ganchos, a place where everything was different, unique, where people from all over the world could have the experience of knowing this little piece of paradise. With no hotel experience, the two created the entire hotel concept through their experiences as guests elsewhere, bringing everything they liked most and taking everything they didn´t, for example, the time to have breakfast – at Ponta dos Ganchos you can have breakfast at any time of the day. The location and the attentive service. 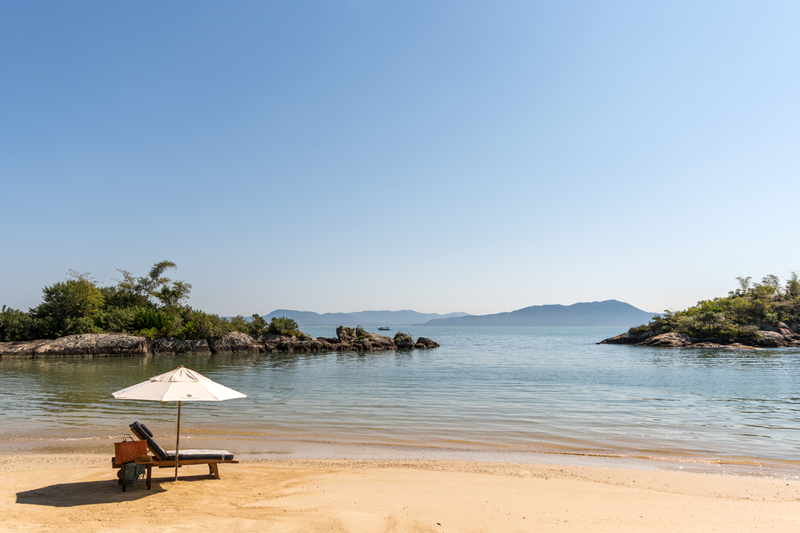 With a ratio of 5 employees per bungalow we manage to personalize the stay of each guest. Located on a private peninsula, Ponta dos Ganchos is surrounded by the stunning waters of southern Brazil’s Emerald Coast. Close by are charming fishing villages, occupied by descendants of the first Azorean immigrants to inhabit the Santa Catarina coast. 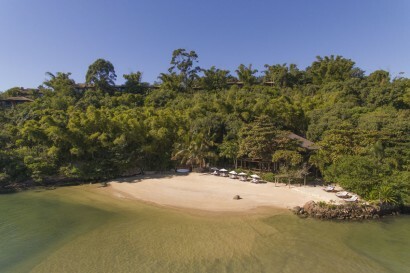 Set against a dramatic, secluded backdrop of verdant rainforest edged by a sandy bay. 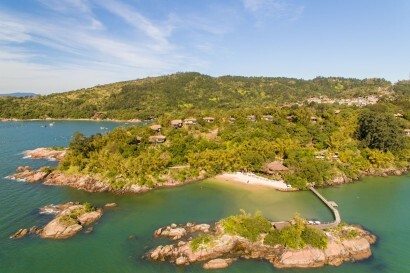 Extremely well located, Ponta dos Ganchos is just 40 km (24.85 miles) from Florianópolis and a short hop from São Paulo, Rio de Janeiro and Buenos Aires. 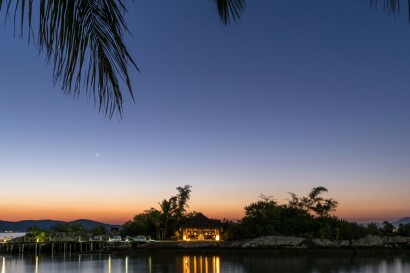 The property is so exclusive that there is no signage in the front. Only the people that have a reservation can find the property. Bungalow Anhatomirim (3) Split-level bedroom and living room of around 860 sq ft (80m2) with two verandas overlooking the sea. Bungalow Arvoredo (12) Single-level bedroom and living room arrangement covering 1025 sq ft (95m2). Comforts include a dry sauna and a private pool set into a spacious deck affording a sea view. Bungalow Vila (4) Approximately 1400 sq ft (130m2) overall, the bedroom and living area are integrated. There is a double bathroom with twin walk-in closets and a dry sauna. 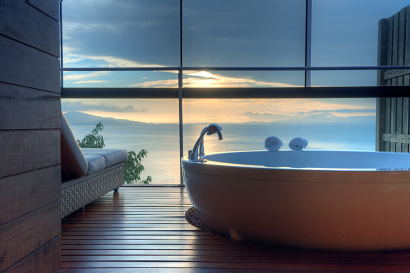 The Jacuzzi is in a glass-walled and glass-roofed conservatory with a sea view. Outside, the bungalow has a private garden and a private pool. Bungalow Especial Vila (1) Approximately 1400 sq ft (180m2) overall, the bedroom and living area are integrated. Extra touches include 600-thread Egyptian cotton sheets. The double bathroom has twin walk-in closets and the dry sauna has a sea view. 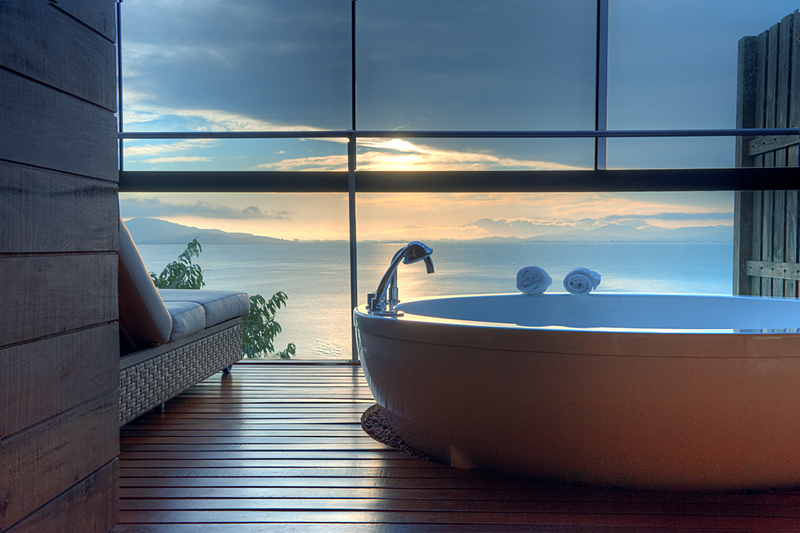 The 12- jet Jacuzzi is in a glass-walled and glass-roofed conservatory with a sea view. 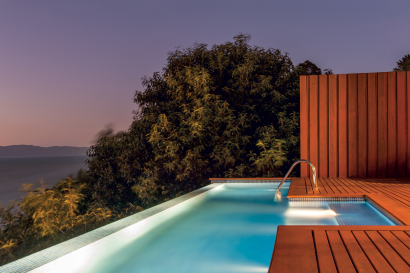 Outside, the spacious deck houses a private pool and offers spectacular views. Bungalow Esmeralda (4) Bungalows with approximately 2460 sq ft (230m²) overall, the bedroom and living area are integrated. 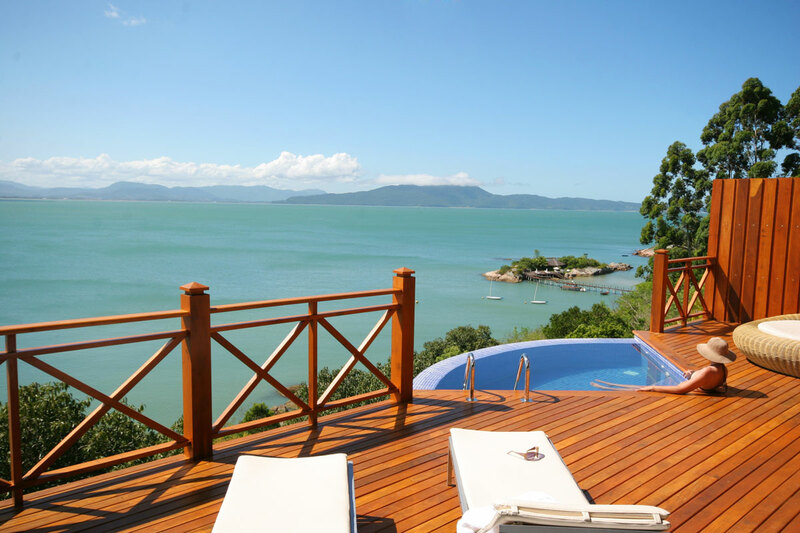 There is a dry sauna with sea view, a Spa-bathroom area with massage tatamis and a wonderful Jacuzzi also with a sea view. 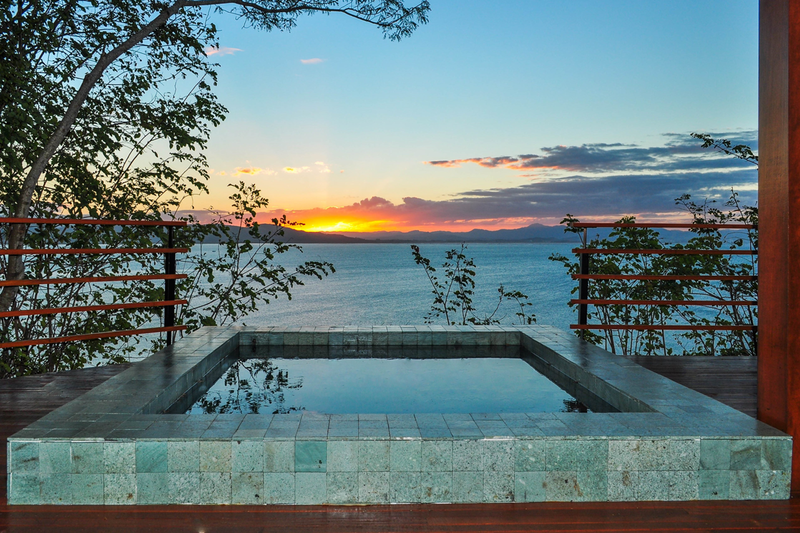 Outside, the bungalow has a private deck with comfortable Chaises Longues and a private fan shaped plunge pool. Extra touches include 600-thread Egyptian cotton sheets. 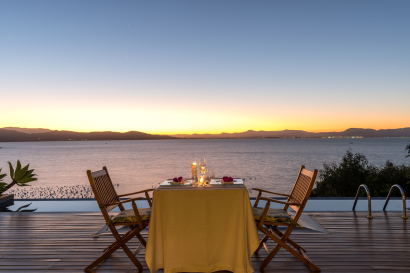 Bungalow Especial Esmeralda (1) Our most sophisticated bungalow, extremely private and stunning view. Approximately 3110 sq ft (300m²) overall, the bedroom and living area are integrated.There is a dry sauna with sea view, a Spa area with massage tatamis and a wonderful Jacuzzi also with a sea view. outside, the bungalow has a private deck with comfortable Chaises Longues and a private lap pool. Extra touches include 600-thread Egyptian cotton sheets. There is also an underground floor with a Private Fitness Center. Our Chef José Nero, strives for the perfect blend of traditional recipes and Brazilian ingredients with international haute cuisine, achieving results that combine simplicity with delicious flavors. 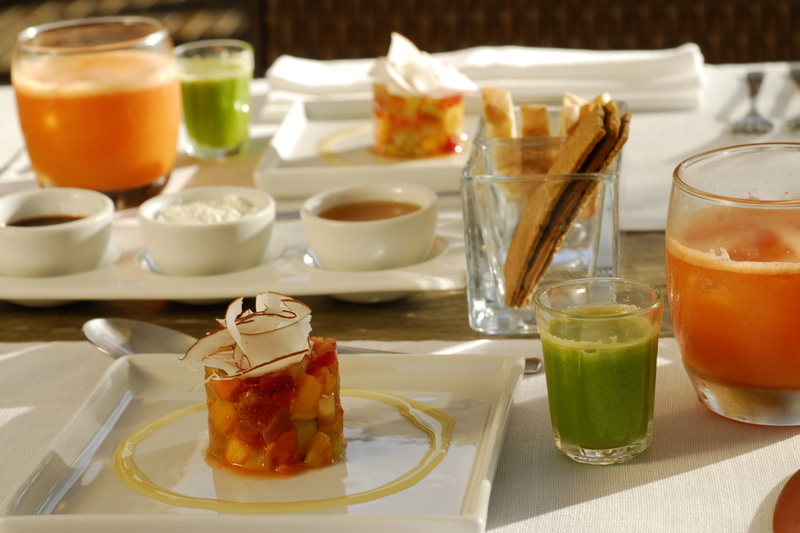 All items are chosen with great care and sourced from the best local, national an international suppliers. First rate quality is a minimum requirement. 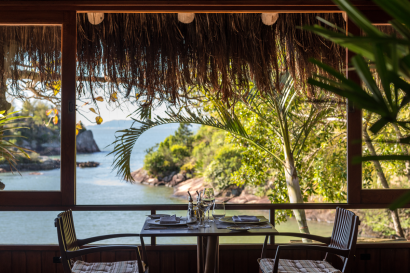 Pride of place is reserved for seafood dishes, in particular for Santa Catarina’s famous oysters, which many people consider the best in the world, such is their taste, texture and delicacy. Our Wellbeing Centre offers a choice of excellent relaxing and therapeutic treatments performed by our team of specialized professionals and available every day at the time of your choice. There are three massage tents at the very end of the Resort’s peninsula. This is a charming spot providing total privacy at the water’s edge and overlooking the three little islands just offshore. The tents are set in a beautiful garden and each has a different view. One offers a wonderful sunset, another a romantic view of the strait between the islets and the third looks out over the whole of the mouth of Ganchos bay.